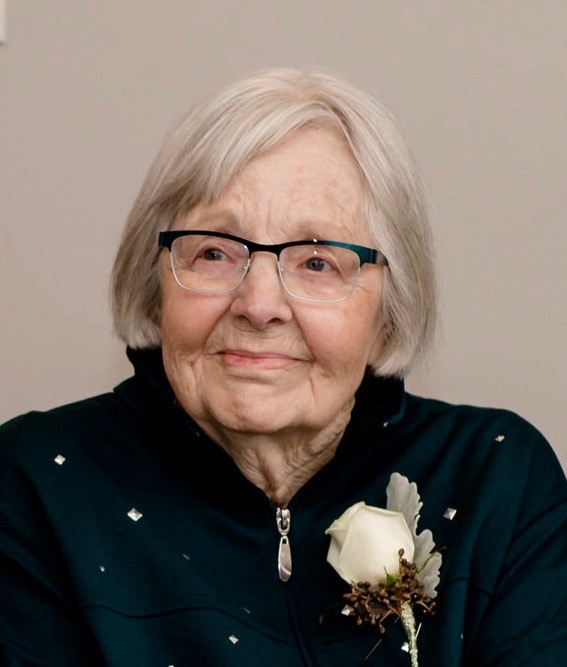 It is with great sadness and much love that we say goodbye to our beloved wife, mother, grandmother and great-grandmother Thelma Doris Riach (Keast), who passed away January 19, 2019 at the age of 91 years. The daughter of Alfred and Mary (Egilsson) Keast, she was born in Calder, SK, but moved with her large family to Roblin, MB, where she went to school and started work. Thelma spent her career in the financial services employed at the Royal Bank of Canada, Nanaimo Community Credit Union, and Woodwards Department store. She was always well liked by her co-workers and customers. This was especially true of one RBC client, a young Roblin lawyer, who was so smitten with her that he set out to romance her and win her love. Thelma and Clarence Riach would spend the next 62 years together in a loving, supportive partnership. After marrying, Thelma and Clarence ‘leap frogged’ throughout Western Canada living in many wonderful communities such as Calgary, Portage la Prairie, Nanaimo, Tsawwassen, Port Coquitlam, and Maple Ridge. With each successive move, their family grew to include three children, in-laws, grandchildren, and most recently a great-grandchild. While the addresses may have changed, the constant was the loving and caring homes that Thelma created. They were full of laughter, support, and of course great family meals. Thelma’s family was her greatest joy and primary focus throughout her life. She created many traditions and routines that unified everyone around important events, our heritage, and individual achievements. Ultimately, however, they were simply a reason to come together as a family. She raised her children and grandchildren with a kind and generous heart. Thelma’s intelligence, subtle sense of humour and giving nature will live on in her children, grandchildren and great-grandchildren. As an avid sports fan, Thelma enjoyed watching the Olympics, curling, and was a dedicated Canucks fan, remaining on the bandwagon, even when they were not worthy of her support. She was a talented gardener, seamstress, and knitter. And was especially skilled at helping to make her kid’s and grandkid’s Halloween costumes a reality. Thelma took great pride in both her welcoming yet stylish homes and personal fashion. Everything was always trendy and colour coordinated, a characteristic that she has passed to other members of her family. Left to cherish her memory is her husband Clarence; children Ron (Karla), Signe, and Russ; grandchildren Danae (Garrison), Keaton (Samatha), Zac, and Mackenzie and great grandchild Isla. She is survived by her brother Bill (Sadie) and many nieces and nephews. She was predeceased by her parents, brothers Harold, Gordon, Calvin, Robert, and sister Marjorie Sharpen. The Riach family would like to express their heartfelt thank you to the staff at Ballie House in Maple Ridge for their care and compassion during the last few years of Thelma’s life. Cremation has occurred and an informal family gathering will be held in the future. Donations in memory of Thelma Riach may be made to the Heart & Stroke Foundation of BC or the Alzheimer Society of BC.